We took Ethan to see Santa Claus today and Ethan LOVED it! I was nervous he might not like being handed to a stranger (even a very friendly, Santa stranger) but he turned right to Santa and pointed at his beard, smiling and laughing. He was so mesmerized by Santa that he didn't want to look at the camera for a photo. When he finally did look at the camera, he seemed annoyed at being distracted so he stopped smiling. As soon as Santa caught his attention again, he was all smiles. This is much better than last year when he slept through the whole experience! 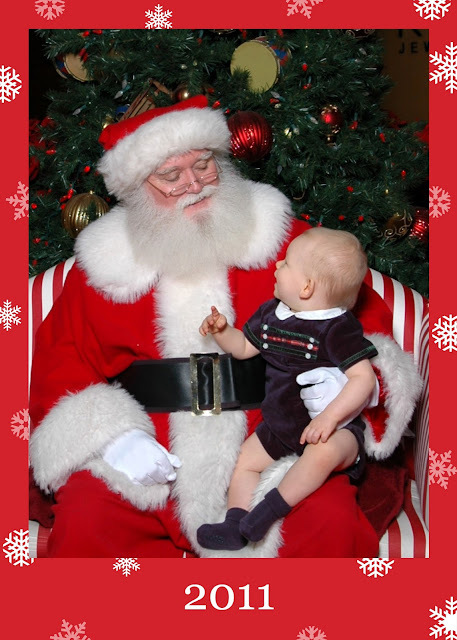 I'm sure he told Santa what a good little boy he has been...and how good his mommy and daddy have been too!